Microsoft’s OEM WMR (Windows Mixed Reality) Virtual Reality headsets. A beautiful piece of hardware, comfortable and stylish. AMAZON.com – 3.6-Stars (6 Reviews) HP version-Canadian sales only? Unless you frequent Best Buy’s reviews before you purchase, you’d be forgiven for thinking that these headsets were so much junk, I mean look at those dismal 3.3 – 3.6 ratings over at HP, Amazon and NewEgg! Fortunately we can pretty much toss those reviews as their complaints from 9mo to a Year ago appear to have been addressed. 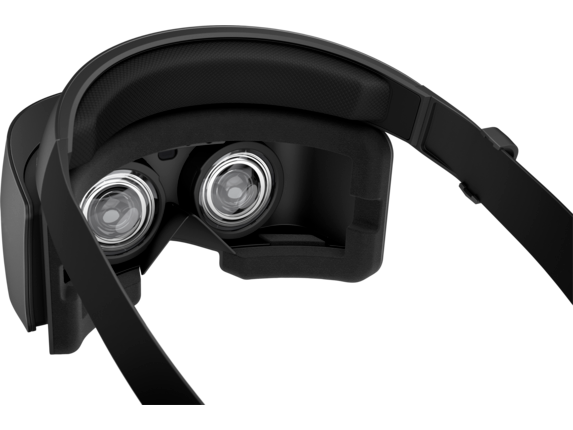 Both the hardware and the software of the VR1000 are now within striking distance of more established VR competitors (courtesy of Microsoft’s massive OEM push). After reading the reviews, I would feel pretty good about buying this headset, with a couple caveats. I’d want to feel it on my head and check out the length of that cord to see if I can live with the physical limitations. It is heavier than some of its competitors, but that might not matter depending on how sensitive you are to such things. It doesn’t have an integrated headphone/microphone so you’ll need to plan for what gear you’ll use for communications. And definitely compare the quality of the graphics and the viewing sweet spot to other similar headsets so you can manage your expectations (some people were disappointed by what they perceived as an in-focus center and a blurry periphery, even though all HMD have this limitation currently.) Users report that you need to redraw the boundaries every time you connect the headset, which gets old, but it’s necessary to avoid having physical boundary sensors to setup in fixed locations in your room like the Oculus Rift. That makes the VR1000 rather portable by comparison (tradeoffs my friends…tradeoffs). Check the hardware requirements before you buy. Also, make sure you are getting the very best (sale) price because I’m seeing a ton of price variation site-to-site. If your local store will price-match then you’re golden. “:Reviews Summary” is a new type of article that I am considering adding to my site. The genesis of this idea is a situation that I find myself in quite often: That of Tech Analyst/Researcher, in fields which I may or may not already be familiar with, ferreting out the very best [insert technology product here] for my friends, family or clients because the sheer volume of information in the market is overwhelming. My initial concept is that I will spend a little time checking out a piece of Tech and read up on the various reviews, then sort of review-the-reviews to provide a Reviews Summary for that prduct. It’s not meant to be all-inclusive, and I expect that I will end up revising product Summaries from time to time as the developers update their firmware, software, iterate to the next version etc, but at least for a moment there will be a snapshot in time to see if that particular item will work for you and you won’t need to read through scores of product reviews to learn the Why behind the Thing-a-ma-jig 3000’s 2-star rating.